REMEMBER when Honda was a little bit posh? Those days weren't so long ago. 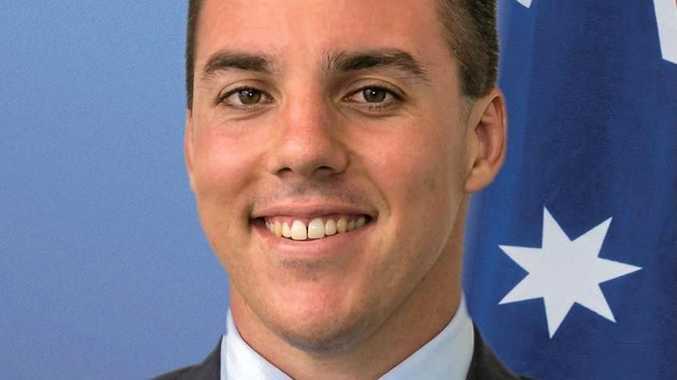 The brand boasted high levels of prestige, sitting head and shoulders above Ford Falcons and Holden Commodores which were starting to plummet off sales pedestals. But somewhere en route to the new millennium the Japanese carmaker lost its way. Sporting heritage was seemingly forgotten, humdrum became the norm, and suddenly the South Korean brands have muscled in and cast Honda aside. Now, Honda is getting back on track. Sporting derivatives like the NSX supercar and Type R hatch are on the radar which has reignited passion in the brand. And this new diesel CR-V is another fine example of where Honda is headed. In a highly competitive and growing genre, the new CR-V achieved 11.6% market share in selling more than 12,500 units last year. That position is expected to strengthen now that the new United Kingdom-built diesels have arrived. We jumped behind the wheel of the range-topping DTi-L, which retails for just above $45,000. Getting your bearings can take some initial analysis. The steering wheel alone has 16 buttons, and the driver's instruments are set up in 3D styling. After the initial introduction everything gels nicely, with clear and concise gauges meaning you don't miss having a digital speedometer option. It repeats much of the same information also available to the driver... and you expect more functionality, like in the Accord where it provides blind spot vision via a camera under the side mirror. Leather trimmed seats provide ample support, and the back bench seat can carry three medium-sized adults if required - aided by good feet and leg room with a flat floor. Whereas the petrol derivative left us wanting slightly more power, there were no additional performance desires with the diesel. Strong and willing, the 2.2-litre oil-burner proved to be the perfect accomplice in wide-ranging conditions. 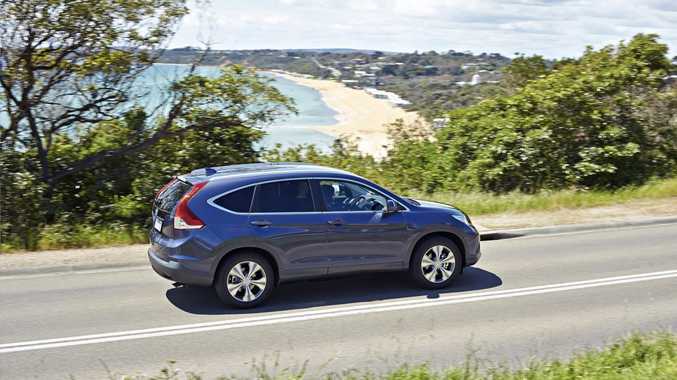 With peak torque available from low in the rev range the CR-V has urge from the get-go which makes zipping into traffic holes or highway overtaking simple. Steering feel is also communicative which gives the driver a good sense of the road. 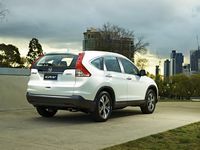 There is a sport mode available, which is accessed by pulling the shifter one notch past drive, but it's really not required as the CR-V is capable in standard "drive". For manual-style control there is the steering wheel paddle shifters, but the auto box does a good job of finding cogs itself. Given the diesel sits atop the range, it rightfully gets a whole heap of kit as standard. DTi-L features include leather trim, Bluetooth phone and audio connectivity with steering wheel mounted controls, push button start, CD stereo, 18-inch alloys, heated front seats, along with five-star safety with stability control, cornering headlights, traction control, along with parking sensors front and back. Five-star safety is across the range, with the usual gear like anti-lock brakes and stability control as well as full-length curtain airbags. 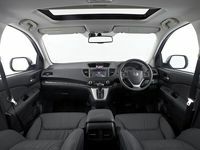 The biggest players it faces are the Mazda CX5 Akera ($49,420), Toyota RAV4 Cruiser ($50,790), Subaru Forester D-S ($43,990), Nissan X-Trail TL ($43,590) and the Ford Kuga Titanium ($47,740). Open the boot, pull on the lever and watch the magic happen. Seats fold flat into the floor in a swift, easy movement to show off an awesome load area. Even opening the rear door is simple, with the gas struts making the boot light for opening and closing. The CR-V actually has a full-size spare, which is unusual nowadays given the proliferation of run-flat tyres and space savers. Among the features in the safety suite is trailer stability assist, which is handy for towing. There is also hill descent assist for stepping off the bitumen. Managing less than seven litres for every 100km, our fuel consumption was actually spot-on the official figure quoted by Honda. Aided by use of the Econ mode, which alters the air con and acceleration response for thriftier driving, it helped deliver 6.9 litres/100km. Honda has now also finally come to the party on capped price servicing but maintenance is still required every six months. Insurance should be in the middle of the scale. 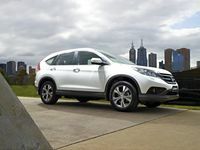 The CR-V has more rounded styling nowadays, and while it doesn't stand out in the SUV crowd it is pretty enough for the most important buyers, mums. With LED daytime running lamps and 18-inch alloys it cuts a fine figure on the road. 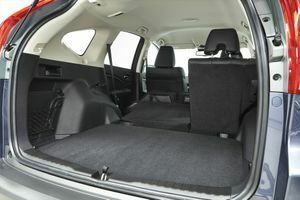 What we liked: Magic folding rear seats are awesome, smooth and strong diesel performance. What we'd like to see: Safety extras like blind spot assist with camera (like in the Accord), more functionality in centre screen. Warranty and servicing: Three-year/100,000km warranty. Capped price servicing is $354 each dealership visit with service intervals every six months or 10,000km (available for a maximum of five years or 100,000kms). Some additional items (such as pollen filters and brake fluid) are required at separate intervals and are all additional costs on top of the servicing. Details: Five-door all-wheel drive mid-size sports utility vehicle. Engine: 2.2-litre turbo diesel generating maximum power of 110kW @ 4000rpm and peak torque of 350Nm @ 2000-2750rpm. Consumption: 6.9 litres/100km (combined average).